What is wrong with this website's title? Your blog's title is your headline. To make the most of it, your headline should say, "HERE IS SOMETHING YOU WANT." This grabs your reader's attention. Don't go for the ego boosting headline, "The Official Blog of So and So". This only works if you are a celebrity. But then again, even celebrities will not use a site title like that. The subheading has to complement your headline. It provides further information that will encourage the reader to read the lines below. Every element has to tie together in such a way that your readers were to sit on a slippery slide. Attention > Interest > Desire > Action. Spend at least a few minutes checking your site for readability. Take a look at this. Would you want to read all that? Use words a child can understand. People never ready every word that is written. They scan for keywords and only stop to read when they find them. 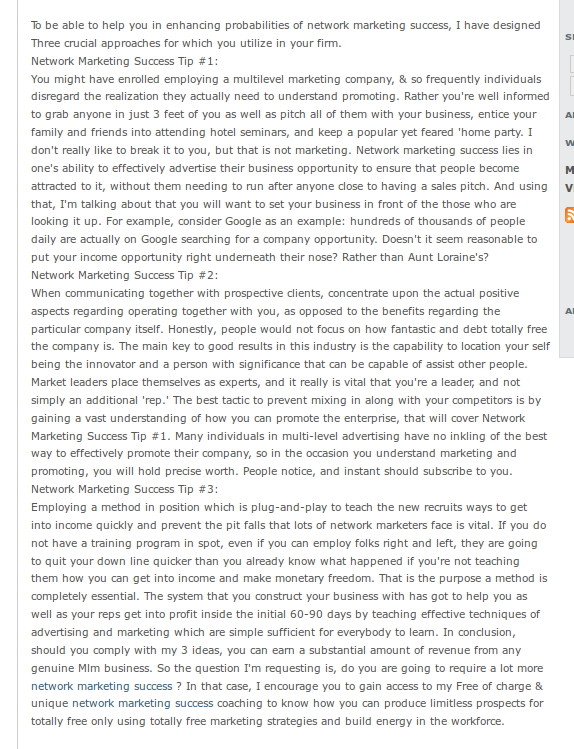 When you are talking about one thing, break them into several paragraphs with a keyword header. This tells the reader, 'this paragraph is about ___." Use bullets and lists. Break down your paragraph into short sentences. Make it easy for people to read your content and they will easily find your call to action. 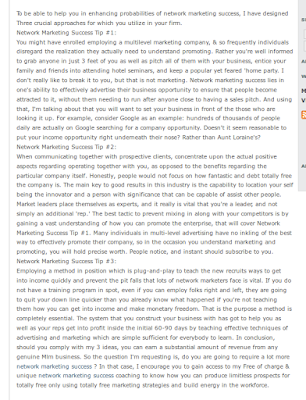 "insert as many keywords while maintaining readability. This helps your site to get better page rank." I totally disagree. Almost everyone who sells something on the internet will optimize their site for SEO. If they were selling widgets, you can be sure that they are going to insert the more popular keywords into their content. How will your website stand out when it reads like everyone else's. Instead, write as if you were talking person to person. As much as possible, avoid talking "corporate-ese." Engage your readers. Do not preach, nor pitch. Your audience will choose to interact with individuals that they like and understand.